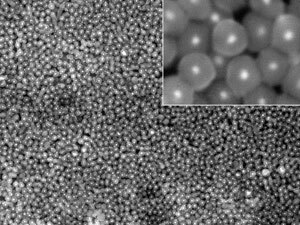 (Nanowerk News) A straightforward and effective process for coating silver, gold and platinum nanoparticles with functionalized silica shells at room temperature has been developed by A*STAR ("Aqueous route to facile, efficient and functional silica coating of metal nanoparticles at room temperature"). Crucially, unlike conventional methods for producing silica-coated metal nanoparticles, this process is based on water and does not employ alcohol, making it both cost-effective and environmentally friendly. Silica-coated noble metal nanoparticles have attracted great interest because they can be used as catalysts as well as in calorimetric and optical applications. They are typically produced using silane precursors, but these are generally insoluble in water. Consequently, alcohol has to be added to water to facilitate the hydrolysis of these precursors, increasing the cost of production and making the process less green. Now, a team led by Ming-Yong Han and Shah Kwok Wei at the A*STAR Institute of Materials Research and Engineering has devised an alcohol-free method for producing silica-coated noble metal nanoparticles. To do this, the team took a commonly used precursor, tetramethoxysilane (Si(OCH3)4), and substituted a polar group (mercaptopropyl) for a methoxy group (O–CH3), which resulted in a water-soluble precursor. Then, to enable this precursor to bind directly with the metal nanoparticle surfaces, they functionalized it with a thiol group (–SH). This process has many advantages. It is straightforward to implement, efficient, universal and easily scalable. Furthermore, since the thickness of the silica shell increases with coating time, shell thickness can be readily controlled up to several tens of nanometers. By slightly modifying the process, Han and colleagues could also produce nanoparticles that have a high activity for an extremely sensitive spectroscopic technique known as surface-enhanced Raman scattering (SERS) and are promising for highly sensitive detection in analytical and biological applications. SERS is based on the hugely enhanced Raman signal generated when a Raman-active compound is adsorbed on a metal surface. The researchers prepared the fluorescence-free SERS-active nanoparticles by sandwiching Raman-active molecules between the noble metal nanoparticle and the silica shell. In particular, Han notes, this water-based route to facile, efficient and functional silica coating of metal nanoparticles at room temperature could be extended to coat metal oxide nanoparticles for green building applications.